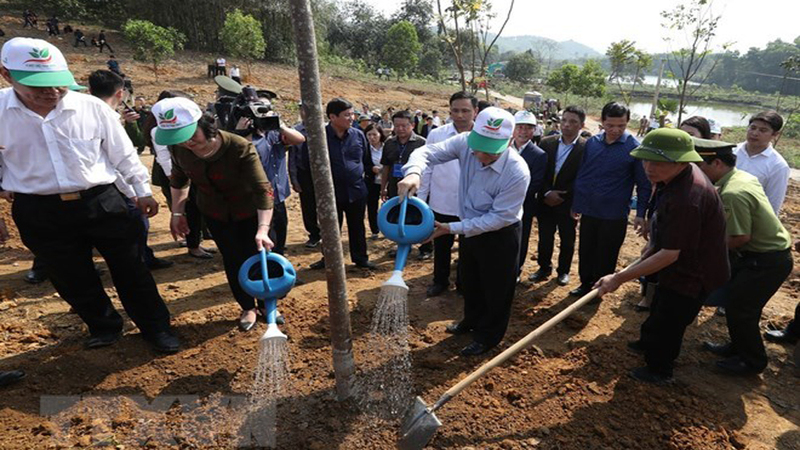 Party General Secretary and President Nguyen Phu Trong launched the New Year Tree Planting Festival in Viet Cuong commune, Tran Yen district, the northern mountainous province of Yen Bai on February 10 (the sixth day of Lunar New Year 2019). On November 28, 1959, President Ho Chi Minh wrote an article which was published on Nhan dan (People) newspaper, stressing the significance of tree planting to each person, each family and the entire nation. It has since become an annual Vietnamese custom each Lunar New Year. The New Year Tree Planting Festival is launched in Yen Bai province. Addressing at the ceremony, the Party and State leader underlined that tree plantation has played an important role in preventing natural disasters, improving quality of the environment, and bettering local livelihoods amidst global warming, climate change and sea level rise, which are billed as one of the formidable challenges to the human beings in the 21st century. He called upon the entire Party, army and people to engage in growing trees and forests as well as taking actions against deforestation as part of efforts to protect the environment. According to Minister of Agriculture and Rural Development Nguyen Xuan Cuong, the country planted more than 231,000 hectares of concentrated forest and over 63 million scattered trees in 2018, raising the forest coverage to 41.65 percent. Meanwhile, the export of forestry products was estimated at more than 9.3 billion USD. The forestry sector’s achievements contributed greatly to the national socio-economic development in the year, he added. In accordance with the Target Programme on Sustainable Forestry Development for 2016-2020, competent agencies and sectors will work to raise forestry production value by 6 percent annually, as well as forestry export to 10.5 billion USD and forest coverage to 41.85 percent in 2019. In Yen Bai province, noticeable changes were seen in forestry production, with additional 15,443 hectares of forest and the forest coverage reaching 63 percent. Following the launching ceremony, Party General Secretary and President Nguyen Phu Trong met, delivered Tet greetings and presented gifts to local ethnic people. Thousands of locals, visitors and Buddhism dignitaries and followers flocked to the opening ceremony of the Tien Pagoda Festival in Lac Thuy district in the northern province of Hoa Binh on February 8. The Lao Cai international border gate in the northern mountainous province of the same name was busy with holidaymakers on the first day of the Year of the Pig (February 5). Travel agencies in Ho Chi Minh City have organized a great number of spring tours for tens of thousands of visitors on the occasion of the beginning of the Lunar New Year (Tet) 2019. The book street festival and the Nguyen Hue flower street celebrating the 2019 traditional Lunar New Year (Tet) holidays opened in Ho Chi Minh City on February 2. A wide range of activities will be held to honor cultural identities of 54 Vietnamese ethnic groups at a festival in Hanoi from February 12-13.